A major archaeological discovery was announced in Leicester, England this week. Experts have confirmed that skeletal remains found during the excavation of a Leicester parking lot are those of Britain’s King Richard III, the last of the Plantagenet kings. 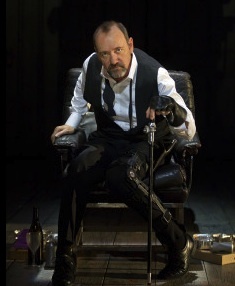 Richard (at right portrayed by Kevin Spacey) was killed in 1485 by Tudor enemies during the Battle of Bosworth Field. The serendipitous timing of this archeological discovery has prompted Michael Hirsh, writing in The National Journal, to engage in a nifty bit of colligation, a 17th century word rarely used today, but one most appropriate this week, since colligation refers to “the abstract tying together of things not previously seen as connected”. Hirsh does not refer to colligation (I take full blame), but he does embody the term when he connects what he “ranks as one of the most titillating archaeological discoveries ever” to the current US Senate Armed Services Committee hearings on the confirmation of Chuck Hagel to be defense secretary. Sure, now we can say these are King Richard’s bones, curved spine and all, but we still know little else about him. The victorious Tudors killed King Richard in 1485—apparently with an ax through the head at the Battle of Bosworth Field—and then induced a first-rate spinmeister, William Shakespeare, to paint him as one of history’s worst villains. What we don’t know is whether that is true. Which history are we to believe coming out of last week’s brutal Chuck Hagel hearing, and which will dominate in the next four years? Because this is what the current conflict over America’s next defense secretary—and the future direction of the administration’s foreign policy—is really about: two different readings of history. It is what Sen. John McCain, R-Ariz., an erstwhile Hagel friend who turned into a caustic critic, was referring to when he said that “fundamental” differences remained between him and President Obama’s nominee to run the Pentagon. On one side are fierce Hagel critics such as McCain and Bill Kristol (left), Washington’s neocon-in-chief, who refuse to back down from their belief that the Iraq invasion of nearly a decade ago was just, and who continue to support the aggressive projection of U.S. military power abroad, especially in Syria. On the other side are Obama, Hagel, and others who warned—quite presciently—of the pitfalls of that policy, and who are running away from military intervention abroad at full speed, even as they ratchet up the “small footprint” use of drones. And now the neocon hawks fear that, like Shakespeare’s Richard III, there will be no place for them at all in Obama’s “weak, piping time of peace.” It is truly the winter of their discontent. On Thursday of this week, the scheduled Hagel confirmation vote was cancelled after the Republican committee members demanded that Committee Chairman Carl Levin delay the final confirmation vote to give them more time to “study” Hagel’s record. Still not satisfied after their earlier committee attacks which focused almost exclusively on Israel (will you be faithful to our special relationship until death do you part?) and Iran (Israel’s current arch enemy), the senators wanted another go at Hagel. With their obsession with Israel and Iran, the Republican senators gave the public a reminder of the power of the Israel Lobby in Washington. They proved to be more dedicated to the state of Israel than to the country which they are supposed to serve. Nuclear-armed Pakistan—where the U.S. frequently targets militants with drone-launched Hellfire missiles—barely merited mention at all. What has all this got to do with Hagel being Defense secretary? As others have pointed out, few senators raised the more serious issues that would immediately confront Hagel should he be confirmed, as he probably will be. I would add one that will come up the first time Hagel as secretary faces the military in a town-hall meeting: What does he expect to be done about military pay, benefits, retirement and health care? Hagel’s policy views are invariably well-thought-out, and he himself qualifies as quite a profile in courage when it comes to the anti-Iraq war side of history. Obama’s famous dismissal of the Iraq invasion as a “dumb” war, and Hagel’s distinguished record of defiance toward his own party to oppose the war, amount to a living refutation of McCain’s and Kristol’s entire worldview. A decade ago, McCain and Kristol were leading hawks who claimed that Saddam Hussein had connections with al-Qaida and that weapons of mass destruction would certainly be found, and that George W. Bush could do it all and still preside over a strong economy. 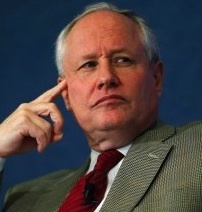 While Kristol was agitating for war and saying things like, “I think we’ll be vindicated when we discover the weapons of mass destruction and when we liberate the people of Iraq” (March 5, 2003), Hagel was warning accurately that there was no evidence of Saddam’s links to al-Qaida, that his possession of WMD were in doubt, and that America was in danger of strategic overreach and enraging the Arab world. The war the Republican minority on the Armed Services Committee has waged against Hagel/Obama, is one they lost when they entered the hearing room. Hirsh further warns the senators that things “are likely to get much worse for the hawks in the second Obama term”. First, despite Kristol’s fulminations, Hagel is highly likely to be confirmed. Second, government sources tell me that one reason that John Brennan took the CIA job is that he wants to ease the agency out of the drone business. Hagel, based on his own worldview and his deep concerns about the moral use of U.S. power and the bad precedents that can be set by its misuse, is likely to also want to ratchet back or at least to exercise more caution about the drone attacks. 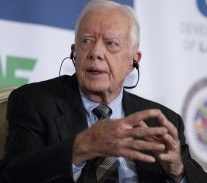 A growing number of critics, including former President Carter (right), say the drone program has badly undermined America’s moral position, and it supplies a dangerous precedent to other nations that are developing their own drone programs, in particular China and Russia, and could cite Washington’s policy to justify, say, political assassinations. Henry Siegman, former AIPAC staffer, writing in the Huffington Post, displays his battle-scarred wisdom with this response to Hagel progressive critics who complained that the future defense secretary had “backed down” on his previous stands. He did not “back down”; he played the political game and refused to take the bait his former Republican senate colleagues threw at him. The Armed Services and Intelligence committees hearings will soon be over. Meanwhile the GOP’s “winter of discontent” has just begun. This entry was posted in -Movies and politics, Politics and Elections. Bookmark the permalink. There’s been a lot of tut-tutting and twisting of apron strings about the way Hagel has been treated (and not asked many relevant questions) in the Armed Services Committee. Hagel and the President are sensiblee not too descend to respond to the scabby vilification from the the McCains and the Grahams. Actions will speak louder than words, once Hagel is confirmed. Particularly if the Administration, with appropriate explanations of “why” from the President,1) reduces drastically the military aid we give Israel ,and 2) sequesters DoD appropriations that Congress did not request and weaponry other materiel not needed or that even reduce the effectiveness of US national defense. Absolutely brilliant! Also, thanks for the opportunity to learn a new word in English, namely, “Colligation”. I notice that there was another example of “colligation” in your article. It is relevant to the vicious “Inquisition Vultures” vying to crucify American Patriot Hagel. The vultures have focused mostly on Hagel’s position on “Israel” and the “invasion of Iraq”, as though they were two different subjects. And here is how my newly acquired word, “colligation” comes into play. In reality, they are ONE and the same. The invasion of Iraq was primarily to destroy Israel’s enemy. It had everything to do with Israel. The hundreds of Billions spent and, more importantly, the American and Iraqi blood that was shed, was for undertaking Israel’s prodding to destroy Iraq. Just as Israel threatens and blusters, today, for the US to destroy Iran. If as some historians believe, Britain and the US created Israel to use it as a henchman to subjugate the Arab Nation on their behalf, then tying Israel to Iraq’s invasion becomes that much stronger. And talking Iraq, it was NOT the “surge” that brought a semblence of “ballancie” in the teetering situation prior to that. It was, rather, the newly applied strategy of “BRIBING” the insurgents into swapping sides. No surge was needed to accomplish that. When Hagel gets confirmed, America will have another opportunity to win back the world, already initiated by President Obama. Why denounce Republicans? Are not Democrats also fools? Did it not seem strange when Nancy Palosi said we had to pass Obamacare to find out what’s in it? I was once a Democrat. I believed in honest money, the middle class, and our enlightened national interests. But then the party was changed. Gay marriage became more important than honest money, and they forgot who William Jennings Bryan was. Abortion on demand and without limit became more important than the middle class. And Al Gore’s theory of global warming, which is quack science, became more important than our enlightened national interests. So I became a Republican, and found guys like Paul Findley, Chuck Hagel, and Ron Paul. Dump hot tar on fools like Lindsey Graham and John McCain. I will join you. But you don’t have to buy into the likes of Barry O who refuses to show us a birth certificate under seal, as all others in his position routinely do, and wants gay scout masters in the Boy Scouts of America, as if the Catholic Church had not already paid through the nose on account of gay priests. Obama happens to be right about Hagel, but even a blind squirrel finds an acorn once in a while. Israel is not our friend, that’s for sure. Go to the U. S. S. Liberty Memorial website, or pick up Mearsheimer and Walt, then read all about it. But meanwhile, keep a sense of perspective on our two major poltical parties. They are necessary, but often not so good. — John Remington Graham of the Minnesota Bar (#3664X) . The Hagel nomination hearing was a revolting display of the power of the Israel Lobby in our Congress. I’m sure fear of offending the lobby, and of Adelson’s billions of dollars that are there to help or destroy a congressperson’s chances of remaining in office, played a large part. Money rules, and single issue groups like AIPAC get what they want– a Congress that puts Israel’s interests first. How can we change this? Only by using the tactics that AIPAC uses so successfully. Neocon Bill Kristol and his pals have tried to paint Hagel as “outside the mainstream,” conveniently ignoring the sad fact that they, more than any other single group, propelled Sarah Palin to a point that potentially placed her a heartbeat away from the Presidency. Although plucked from the wading pool of politics, Palin had the primary virtue of being able to see Israel’s overarching interests from her home in Alaska. I fervently wish you to be right about a Winter of Discontent for GOP and other hawks (and AIPAC). I’m not so sure. The vast amount of money and interest (way beyond AIPAC/Israel) involved in a militarized foreign policy suggests it will take a very long time even to shift such policy a bit. Obama et al. may (?) want to do that, but so far have proven very timid (or is the word “realistic”) in confronting such deep vested interests.